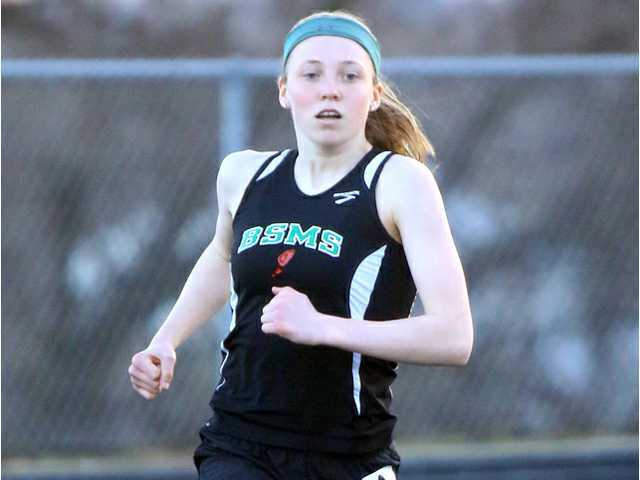 Benton freshman Kayci Martensen ran away with the title in the girls 1,600 at the recent Wisconsin Track & Field Association State Indoor Championships last Saturday. WHITEWATER — Benton/Scales Mound/Shullsburg freshman Kayci Martensen ran away with a state title at the 2019 Wisconsin Track and Field Association State Indoor Championships held at UW-Whitewater’s Kachel Fieldhouse on Saturday, April 6. Martensen turned in a phenomenal time of 5:00.95 to out-distance the field of 44 runners to win the girls’ 1,600-meter run. The time would have been fast enough to win last year’s Division 3 outdoor state title by nearly 14 seconds. Martensen added another title to her burgeoning collection by winning the girls’ 800-meter run in a record-shattering time of 2:17.14. She beat the previous meet record by over 14 seconds. The Benton frosh also teamed with Chloe Matthew, Joelle Sigwarth and Abbie Wiegel to place second in the 1,60-meter relay (4:35.28). Bowen had a career game in Lancaster’s 16–6 non-conference victory over visiting Fennimore Monday afternoon, going 4-for-5 with two triples, a home run, seven RBIs and four runs scored in the rout. He finished just a double shy of the cycle. Bowen also went 1-for-4 with a pair of runs scored and drove in two in the Flying Arrows’ 6–5 SWC victory over River Valley on Tuesday. Lancaster improved to 4–1 on the season and 2–0 in the SWC. The senior right-hander struck out five and hurled a five-inning no-hitter to lead Fennimore (3–4, 3–1 SWAL) to a 10–0 SWAL victory over Southwestern last Friday. Fitzgerald pitched well in Tuesday’s conference showdown at Mineral Point, but was let down by three Fennimore errors in an 8–4 loss to the Pointers. Fitzgerald (2–1) allowed seven runs, only one earned, on six hits and two walks in 4 1/3 innings pitched. He is also batting .533 (8-for-21) this season through seven games, with five doubles, five RBI and seven runs scored. Hooper scored two goals and passed out two assists in Platteville/Lancaster’s 7–0 victory over Galena/River Ridge last Thursday afternoon. She also had an assist in a 2–0 non-conference victory at Wisconsin Heights Friday afternoon. Larson won the 110-high hurdles (16.20), 300 hurdles (50.96) and finished second in the long jump (19’0”) to lead the Fennimore boys to a fifth-place finish at last Tuesday’s 10-team Boscobel Early Bird Invitational.